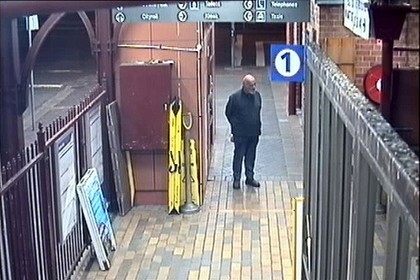 CCTV footage shows the elderly bashing victim calmly waiting for the train on which he was fatally & brutally attacked. An elderly man waits at Newcastle station to board the Sydney-bound train, a journey that would ultimately cost him his life. Strike Force Ploughman detectives have launched a murder investigation after the 76-year-old man died in John Hunter Hospital on Saturday night, less than two days after he was savagely beaten on the lonely ride somewhere between Newcastle and Fassifern stations. Homicide squad members have joined Lake Macquarie investigators in their hunt for the man’s attackers. Detectives last night released the closed circuit television footage of the victim waiting patiently near the guard room on the Newcastle station platform shortly after 3am on Friday. Less than an hour later he boarded the 3.59am service to Central Station, and less than 30 minutes after that he suffered severe head and facial injuries in a beating that was to prove fatal. Commuters found him in a pool of blood minutes before the train was due to stop at Fassifern about 4.27am. Strike Force Ploughman detectives are continuing to trawl through security vision from a series of train stations and on board the service. The service is known to have stopped at Civic, Wickham, Hamilton, Broadmeadow and Cardiff stations before it arrived at Fassifern. Detectives are yet to confirm the man’s identity, although he is believed to be from Sydney. He is described as being of Mediterranean or Middle Eastern appearance and 160 centimetres tall. He was wearing a dark grey sloppy joe, dark pants and brown leather boots. Investigators are also keen to piece together the man’s last movements before he boarded the train at Newcastle and believe people may have seen him in the central business district in the early hours of Friday. Early reports that the man was homeless are also yet to be confirmed. Anyone with information is asked to phone Lake detectives on 4942 9999 or Crime Stoppers on 1800 333 000.